This was not the first time Manchester United have failed to turn dominance into victory and not the first time Jos� Mourinho has been sent to the stands. United will rue their lack of ruthlessness and Mourinho may regret the 27th-minute incident in which he kicked a water bottle in anger at the booking by Jonathan Moss of Paul Pogba for diving, which was actually proved to be the correct decision by the referee. Mourinho received a one-match ban for verbal misconduct towards Mark Clattenburg during the draw here with Burnley in October. The United manager may well be handed a similar punishment � at a minimum � for his behaviour on Sunday, with Moss also the referee who dismissed him against West Ham United at the Boleyn Ground when he was with Chelsea last season. Speaking in Mourinho�s absence his assistant, Rui Faria, said the manager�s ire derived from Pogba apparently deserving a foul earlier in the same incident, though what evidence there was seemed inconclusive. None of this should distract from another disappointing result for United that leaves them with 20 points, their poorest return after 13 matches since the Premier League began. Towards the end, Henrikh Mkhitaryan hit the right post and Jesse Lingard finished but this was adjudged offside. Pogba went close with a shot Darren Randolph � who had a fine outing � saved impressively. However, despite the grandstand finish United might have lost. At the death the replacement Ashley Fletcher forced David de Gea into a frantic close-range stop. This means Manchester United are now 11 points behind Chelsea and any title-challenging hopes distant. Faria dead-batted a question on whether the prospect is now gone. �In this moment we are more looking to the team and trying to get the best results,� he said. �We knew the job was not easy and we try to change things. We believe things will change and what we are chasing will arrive for sure. For the third time this season United were caught out at the kick-off. The previous two occasions led to goals by Chelsea (after 40 seconds) and Fenerbahce (two minutes) � and 90 seconds were gone on Sunday when United went behind. This was simple stuff. Dimitri Payet lifted a free-kick in from the right and Sakho eased ahead of Zlatan Ibrahimovic to head home. Ander Herrera may or may not have been impeded by Michail Antonio as the ball flew past but Ibrahimovic should still have done better. 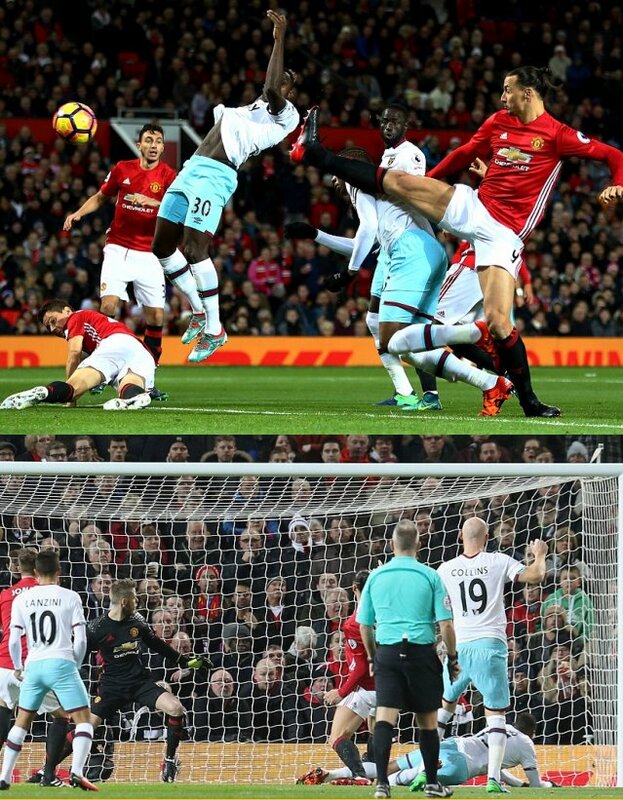 Or, perhaps, an actual defender � Phil Jones or Marcos Rojo � might have been detailed to mark Sakho. The bottom line was that the Portuguese was reduced to waving his men back to restart quickly and United were behind far too soon. Slowly, United took over and, 19 minutes later, equalised via the intelligence of Pogba and Ibrahimovic. When the Frenchman looked up he saw the No9 darting into space and landed a chip on his head from which Ibrahimovic beat Randolph for his ninth goal of the season. Then came Mourinho�s latest altercation with an official. When Pogba went down following a Mark Noble challenge it appeared the Frenchman had been fouled. Mourinho was incandescent that he was booked but replays showed Moss was correct. Moments before, Payet had bought a free-kick when Ander Herrera seemed to make zero contact and this also made Mourinho cross. This may have added to his fury at Pogba�s yellow card yet, really, he should have calmed himself. Instead, a water bottle went flying and off he went, though where to exactly was a mystery. Arsenal�s 3-1 win against Bournemouth earlier had increased the need for United to win if they wished to keep the top four in sight. So as he ordered his side out for the second half Mourinho surely urged them to hunt for the three points. The XI chosen showed six changes from Thursday night. Out went Wayne Rooney, Mkhitaryan, Luke Shaw, Sergio Romero, Michael Carrick and Daley Blind. In came De Gea, Rojo, Matteo Darmian, Marcus Rashford, Lingard and Herrera. There was a place, too, for Bastian Schweinsteiger on the bench � yet by the close West Ham had an invaluable point and United were staring at a fourth consecutive home league draw.